Parents – Sign up for text alerts! 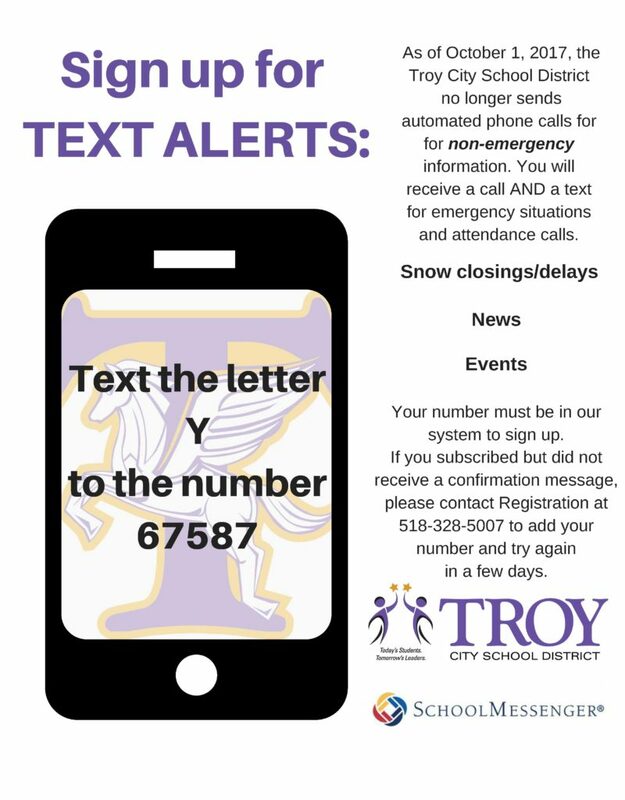 Based on the responses from a 2017 parent communications survey, the Troy City School District is switching to text messaging from auto calls for non-emergency communication with guardians. Non-emergency communications includes snow closings/delays, events and news. To receive these text alerts, guardians must subscribe by texting the letter “Y” to the number 67587. We must have your number in our system to successfully subscribe. If you do not receive a confirmation text, please contact Registration at 518-328-5007 to make sure we have your number and try again in a few days. You will continue to receive a call and a text until October 1, 2017 when we fully switch to text alerts. You will ALWAYS receive a call and a text in the event of an emergency.